We Baby Boomers were never big on conformity. Voluntarily or not, a large number of us fully intend to stay in the workforce to age 70 and beyond. If 70 is the new 65, we will see significant changes in the ways people spend their money and the kinds of investments they want. Matthew Tracey and Joachim Fels of PIMCO outline some of the possibilities in this report. I found it very interesting, and I think you will, too. Speaking of things changing, the weather in Texas has been nothing like anything in the past. It is mid-February and I’m having to turn the air conditioner on at night. The forecasters tell us it’s going to get into the 80s on Friday. Talking with my long-term Texas friends, none of us can remember weather like this. Cooler than normal summers, milder than normal winters. I guess it’s a good thing it’s not like this every year, because then we’d have a wave of tax refugees showing up from California. Then again, this is Texas. If we wait a bit I’m sure we’ll get our usual ice storms and other nasty stuff. Winter is coming. Maybe. I am struggling to keep up with the research my 20-some teams are developing for the chapters of The Age of Transformation. Thankfully I have a small team helping me review the research, which is on top of the research I’m doing for the five or so chapters that I’m personally writing. Plus, there’s my regular reading for doing the weekly letters and so forth. It is forcing me to sort through the pile of items in my inbox as to what is must-read, what can wait, and what I just don’t have time for. I really am learning to depend on people to make sure the things that I must read get on my radar screen. I’m going to go ahead and hit the send button, as I have to prepare for an interview with CNBC Asia on Japan and related topics. You have a great week, and I hope that wherever you are, your weather is as good as ours. We strongly disagree with that thesis of an imminent demographics-induced savings drought. Rather, we have argued in recent work that the global excess supply of saving over investment, which has been largely responsible for the secular decline in equilibrium interest rates, is not only here to stay but likely to increase further in the coming years for a host of reasons including demographics (see PIMCO Macro Perspectives, “No End to the Savings Glut,” September 2015). As a consequence, we continue to expect the fundamental forces of elevated desired saving to keep the equilibrium real rate depressed and to limit the extent to which other (cyclical) factors can drive up market interest rates. · People 35–64 earn considerably more income than people younger and older – so for any given savings rate, this age group’s saving behavior will have an outsized effect on saving and investment flows in dollar terms. To recap: The most impactful seniors are working (and saving) later in life as functional age and the duration of retirement both increase.3 Therefore, our preferred measure of the demographic support for saving is a dynamic, not static, ratio that accounts for the trend toward longer working lives. Let’s revisit our Peak Savers versus Elderly ratio from Figure 2. In decades past, age 64 may well have been the sensible upper bound for the Peak Saver group. But what about the coming decades? In Figure 5, we have added a dynamic ratio (red line) that assumes seniors work roughly five years later in life in 2050 than they did in 2000. In other words, our age definition of “Peak Saver” evolves dynamically from 35–64 in 2000 to 35–69 by 2050, and consequently our definition of “Elderly” evolves dynamically from 65+ to 70+ over the same period. We concede that our dynamic ratio forecast is only a guess as to what the future may look like if current trends persist. But there is some method to the madness. For example, the reason we start to phase the 65- to 69-year-olds into our Peak Saver group specifically in 2000 is that senior labor force participation began to rise rapidly in that year (after two stagnant decades). Our five-years-later-in-life-by-2050 employment assumption is slightly more arbitrary, but reasonable given that, globally, the largest increases in retirement age likely lie ahead of us. And our dynamic ratio does not account for the rising share of seniors 70+ who remain working, introducing an element of conservatism to our assumptions. So while our dynamic ratio embeds some simplifying assumptions, to be more scientific risks missing the forest for the trees. Almost regardless of the assumptions used, if you define a dependency ratio dynamically – based even loosely on observable tr ends – you are likely to paint a very different (and more accurate) picture of the future than you will paint using a static ratio. · Second, individual asset accumulation and drawdown patterns vary significantly by income level. In the U.S., individuals in the lowest income quintile tend to sell their limited financial assets beginning in their 50s and completely exhaust their assets by, or before, death (relying on social assistance to meet their basic needs in life’s latest stages). Middle-income individuals tend to draw down financial assets beginning in their 60s but not at a rate that would deplete their assets before death. Individuals in the highest income quintile, however, are shown to have rising financial asset balances until roughly age 80 (after which they decline only very gradually). Here’s the key: Top-income-quintile households own over 80% of U.S. household financial assets. Consider how significantly this group’s future asset accumulation and drawdown profile will impact financial markets! 2. Bond selling tends to peak in the years after age 80 (as individuals sell down their financial assets to fund consumption in retirement). Now let’s go a level deeper. In the Appendix we model the potential demographics-related asset flows we might see over time from the gradual de-risking and drawdown of household financial assets. We analyze 10 unique scenarios in order to test a range of assumptions. Our “baseline” scenario reflects a set of assumptions about de-risking behavior and asset decumulation that we think is realistic (and possibly conservative) based on historical patterns. Our modeling suggests that U.S. demographics-driven fixed income inflows are likely to be almost as strong 10 years from now as we project them to be today – and that demographics may not be a material headwind for bonds until the 2030s. How can we explain these conclusions? In our analysis, for at least the next decade, de-risking flows and rebalancing flows into fixed income more than compensate for seniors’ portfolio drawdowns. In stress testing our baseline assumptions we found it hard to come up with a plausible scenario in which U.S. demographics become a fixed income headwind within 10 years. Yet we found it easy to imagine realistic scenarios in which demographic demand for bonds remains robust for the next 15 years or more. Consider as an example the high-earning elderly, for whom longevity risk is rising rapidly as life-extending medical technologies proliferate. High earners, historically, have been overly cautious in recalibrating their spending to meet anticipated future needs – a finding that could warrant an even more gradual asset-drawdown trajectory for this next generation of retirees than we have modeled based on historical experience. See the Appendix for our assumptions, baseline scenario modeling and alternative scenarios. · We’ve just gone over a demographic cliff; globally, the ratio of high-saving adult workers to dissaving elderly is now declining. This demographic reversal will erode the demand for saving. · The global savings glut will reverse as the demand for saving falls, pushing the global neutral interest rate higher. · Baby boomers in the U.S. will compound the problem as they sell their financial assets (including bonds) to fund retirement consumption, driving U.S. fixed income yields higher. o Traditional dependency ratios – which use fixed, static age definitions – are flawed because they fail to account for how the world is changing. o U.S. elderly, especially the highest earners, are working and saving later in life. High earners matter a lot because they drive the lion’s share of global saving. 70 is the new 65.
o Similar trends can be observed in economically significant economies outside the U.S.
o We argue for a dynamic, not static, ratio of mature adults to elderly that does account for how working and saving behaviors are changing. Our dynamic ratio suggests that demographic support for saving may be as strong over the next decade as it has been over the past several. Possibly stronger. o Strong saving demand should support a low global neutral interest rate in the coming years – and should continue fueling the global savings glut. o The lion’s share of U.S. household financial assets is held within age cohorts that will need to grow their fixed income allocation over the next ten years. o Top-income-quintile households own over 80% of these assets, and high earners sell financial assets only very gradually in retirement to fund consumption. o For another decade or more, demographics should remain a net contributor to fixed income flows, as high earners’ de-risking into bonds should dominate bond outflows due to portfolio drawdowns. o Long-term annual risk asset return: 5% nominal. o Long-term annual fixed income return: 2.5% nominal. · Alternative 1: De-risking into fixed income proves significantly faster than expected (ultimate fixed income allocation of 50% is reached 10 years earlier than baseline glide path suggests). · Alternative 2: De-risking into fixed income proves significantly slower than expected (ultimate fixed income allocation of 50% is not reached until 10 years after baseline glide path suggests). · Alternative 3: Seniors 50+ ultimately de-risk much less significantly than baseline glide path suggests (fixed income allocation reaches 15% at age 50, per glide path, but then flat-lines for 10 years before gradually increasing to a level only half that suggested by baseline glide path, i.e., a terminal allocation of 25% instead of 50%). · Alternative 5: Top-income-quintile households re-optimize each year to ultimately draw down 75% of their financial assets by the end of their planning horizon, while households in the bottom four quintiles re-optimize to draw down 100% (for both groups, a far higher drawdown percentage than is likely). · Alternative 6: Top-income-quintile households commence drawdowns a full decade earlier than history suggests is likely, i.e., at age 70 (if anything, as life expectancies and planning horizons lengthen, one might expect drawdowns to begin later). · Alternative 7: A combination of alternatives 5 and 6 (i.e., a highly conservative mix of assumptions). · Alternative 8: Households commence drawdowns five years later and lengthen their planning horizon by five years (optimistic, but plausible given rising longevity risk and rising labor force participation among the high-earning elderly). · Alternative 9: Top-income-quintile households re-optimize to draw down 25% of their financial assets by the end of their planning horizon (instead of 50%), consistent with a high bequest motive and historical excess conservatism during retirement. Significant differences are worth highlighting between the SCF and the household balance sheet data contained in the U.S. national accounts. Of note, the 2013 SCF excludes about $19 trillion in DB pension entitlements and $2.4 trillion in assets of nonprofit institutions. As a result of these and certain other omissions, the SCF identifies a materially lower total value for U.S. household financial assets than the national accounts identify. The question, for us, is whether there is any reason to think that the omissions made by the SCF, notably DB pension entitlements, will bias our results. We see no obvious bias. At a high level, DB pension plan asset allocations tend to be a function more of the level of interest rates and plan funding status than of the age profile of plan beneficiaries. Also, as we’ve argued in the body of our note, as the U.S. shifts from defined benefit to defined contribution schemes we may see additional support for fixed inc ome given that DB plans seem to allocate less to bonds than a market-average glide path suggests is optimal for DC participants. For these reasons, we think using a source that excludes DB pension entitlements likely leads us – if anything – to underestimate demographics-related fixed income demand over the next decade. · Mercedes Aguirre and Brendan McFarland, “2014 Asset Allocations in Fortune 1000 Pension Plans,” Towers Watson, October 2015. · Robert Arnott and Denis Chaves, “Demographic Changes, Financial Markets, and the Economy,” Financial Analysts Journal Volume 68 Number 1, 2012. · Charles Bean et al., “Low for Long? Causes and Consequences of Persistently Low Interest Rates,” Geneva Reports on the World Economy 17, International Center for Monetary and Banking Studies, October 2015. · Lisa Dettling et al., “Comparing Micro and Macro Sources for Household Accounts in the United States: Evidence from the Survey of Consumer Finances,” Finance and Economics Discussion Series 2015-086, Washington: Board of Governors of the Federal Reserve System, 2015. · “The Eurosystem Household Finance and Consumption Survey,” Statistical Paper Series No 2, European Central Bank, April 2013. · “2013 Survey of Consumer Finances (SCF),” Federal Reserve, September 2014. · Michael Gapen, “Demand for safe havens to remain robust,” Barclays Equity Gilt Study, February 2013. · Michael Gavin, “Population dynamics and the (soon-to-be-disappearing) global ‘savings glut,’” Barclays, February 2015. · Charles Goodhart et al., “Could Demographics Reverse Three Multi-Decade Trends?” Morgan Stanley, September 2015. · Dr. Michaela Grimm et al., “Allianz Global Wealth Report 2015,” Allianz SE, August 2015. · Markus Lorenz et al., “Man and Machine in Industry 4.0: How Will Technology Transform the Industrial Workforce Through 2025?” Boston Consulting Group, September 2015. · Dr. Susan Lund, “The Impact of Demographic Shifts on Financial Markets,” McKinsey Global Institute, June 2012. · “Pension Markets in Focus,” The Organisation for Economic Co-operation and Development, 2015. · James Poterba et al., “The Composition and Draw-Down of Wealth in Retirement,” NBER Working Paper 17536, October 2011. · Karen Smith et al., “How Seniors Change Their Asset Holdings During Retirement,” Center for Retirement Research at Boston College Working Paper 2009-31, December 2009. 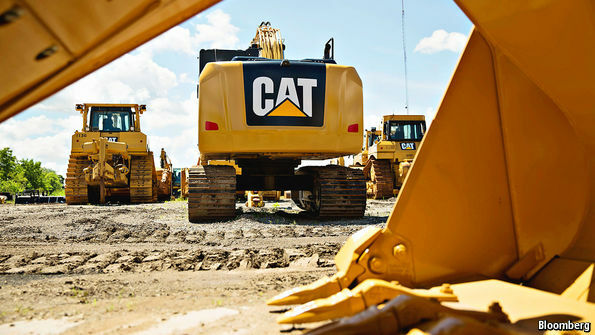 CATERPILLAR is one of the most renowned industrial brands. It makes the kind of heavy machinery—loaders, excavators and off-road trucks—that is used in the construction, mining and transport industries when things need to get dug out or shifted somewhere. But the firm’s latest results, released on January 28th, show that it is struggling to shift its own products. “This past year was a difficult one for many of the industries and customers we serve,” it said. Revenues in 2015 were nearly 15% lower than they were in 2014, and 29% below the 2012 peak. The company’s woes are emblematic of the problems facing manufacturers worldwide. Although manufacturing is a much smaller part of most developed economies than services—just 12% of output in America, for example—its recent weakness makes many economists nervous about the wider outlook. Recent data point to the size of the problem. Big jobs cuts have been announced this year by GE, Tata Steel and Bombardier. In December industrial production fell by 0.7% in Italy, 1.1% in Britain, 1.2% in Germany and 1.6% in France. 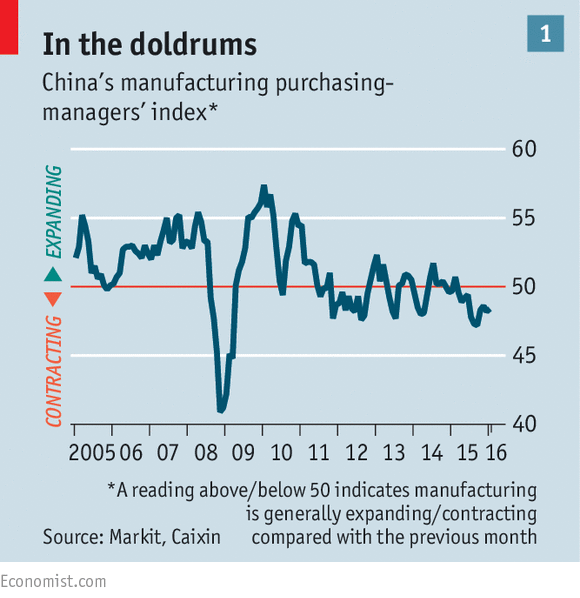 In China both the official purchasing managers’ index (PMI) of manufacturing activity and that of Caixin, a leading financial magazine, are below 50, the threshold that indicates contraction (see chart). In America, manufacturing output rose by 0.5% in January but only back to its level in October; it has fallen in four of the past six months. The manufacturing PMI, compiled by the Institute for Supply Management, has been below 50 since October. Services-sector PMIs in most countries, by contrast, indicate continued expansion. A slowdown in Chinese economic growth, as the authorities try to switch from an investment-led to a consumption-led model, is blamed by many manufacturers in the developed world for their problems. The steel industry is suffering from the effect of past Chinese investment, which has led to massive overcapacity and plunging prices. China’s demand for raw materials in the first decade of this century also prompted mining companies to step up production, and shipping companies to build more vessels. As Chinese demand has dropped, both industries have taken a pounding. Bloomberg’s commodity index has fallen by 28% over the past 12 months. The Baltic Dry index of shipping rates is down by 98% from its peak. The latest data show that Chinese imports, by value, have fallen by 18.8% over the past year. Yet China itself is suffering from weak global demand; the value of its exports has fallen by 11.2% over the same period, including declines of 10% to America and 12% to the EU. Before the financial crisis, global trade used to grow faster than GDP, now it is lagging behind. The OECD, a club of mostly rich countries, estimates that trade volumes last year grew by just 2%. The sluggish nature of trade growth has a disproportionate impact on manufacturing. Around 25% of all American manufacturing jobs are linked to trade, compared with just 6% of jobs in services. Even though overall job growth in America has been strong, there were no net gains in manufacturing employment last year. In trade-intensive American industries, Bank of America Merrill Lynch estimates that output was growing at an annual rate of just 0.1% by the end of 2015. Falling commodity prices also mean that oil and metals producers are not investing in new plant and equipment, which hurts the companies that produce such goods. Exxon Mobil, an oil giant, has announced a 25% cut in its capital-expenditure plans for 2016, for example. 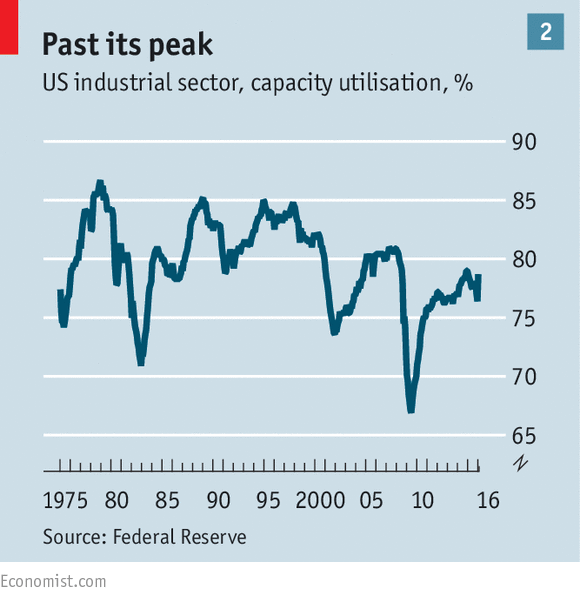 American capacity utilisation, a measure of how much productive capacity is not idle, may have peaked at a lower level than in previous cycles (see chart). Firms seem to be struggling to sell what they produce: the inventories-to-sales ratio is higher than at any time since the financial crisis. By the time the fourth-quarter reporting season is over, American industrial companies in the S&P 500 are expected to have reported an annual decline of 5.4% in earnings and 7.3% in sales. The rising dollar is a problem for American firms, as it makes their wares more expensive. On a trade-weighted basis, the greenback is up by 22% since mid-2014. That is painful for companies that make low-margin commoditised goods such as paper or plastics. But currency movements cannot explain the weakness in European manufacturing; the trade-weighted euro has dropped by 11% over the past five years. The best hope for manufacturers is that this weakness is temporary. Falling commodity prices have had a short-term impact on the energy and materials industries. But in the medium term, lower prices should be good for consumer demand in the developed world, and they will step up their purchases of manufactured goods. Carmakers have already shown that it is possible to buck the trend. Low petrol prices encouraged American car buyers last year, with sales hitting a record 17.6m. As for China, recent data may be distorted by the effect of the lunar-new-year holiday. Chinese road freight grew last year; officials have started breaking out consumer-focused industries within its official PMI, and those data still seem robust. In a rare interview published this week by Caixin, Zhou Xiaochuan, the head of China’s central bank, dismissed worries on the part of developed-world manufacturers that the Chinese would devalue the yuan to enhance the competitiveness of their exports. He vowed not to pursue a policy of competitive devaluation, and insisted China had more than enough in foreign-exchange reserves to fend off those who were speculating against the currency. His comments sent the beleaguered yuan soaring: it hit its highest level this year on February 15th. For the moment, however, pessimism reigns. Even the shares of carmakers have taken a battering in the early weeks of 2016, underperforming the rest of the market. Global fund managers polled by Bank of America Merrill Lynch now have their lowest weighting in industrial stocks since 2011. Perhaps the much-larger services sector will pull manufacturing out of its rut. But investors are not counting on it.